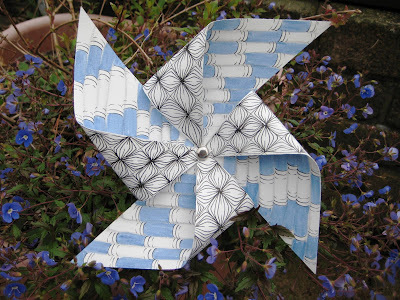 Laura's Challenge #87 is celebrating Pinwheels for Peace for September 21 the International Day of Peace . I chose to make a Pinwheel with just 2 tangles...marasu and yincut with a touch of peaceful calm blue. This is REALLY thrree-dimensional. Love the blues... so calming and 'peaceful'. Clever response to this challenge. Is it springtime down under? Delicate little purple/blue flowers. Lovely. Yes it's spring here Tricia, the flowers are lobelia. Beautiful pinwheel, beautiful tangles, beautiful photo. Great job. Lovely! Also lovely to see it on a bed of flowers! very very pretty indeed - such a gorgeous blue and perfect tangle work. Like the contrast of the two. Maybe if I keep trying will get the consistency of the tangles. Understand why my sister is a fan of your work. So beautifully staged. Your pinwheel is just gorgeous. Lovely! Did you tangle both sides of the paper and then form the pinwheel? It's perfect with just the two tangle patterns. Great job. Yes Emily, I tangled both sides first. Lovely! The picture with the blue flowers is just perfect for you pinwheel! So lovely...it caught my breath! So simple and beautiful! Really pretty! The blue is so perfect and using just two patterns gives it a perfection that can so be seen in the photo. I love that you made a real pinwheel!